Be More Marketable In Their Job Search"
Author of "Forget Job Security: Build Your Marketability! Finding Job Success in the New Era of Career Management"
This teleseminar is based on Dawn's new book, published in September. She shares strategies to help your clients consciously and proactively prepare for new employment opportunities or handle unplanned job transitions smoothly in today's uncertain world of job insecurity. Dawn shares an overall concept of ongoing career management that can purposefully guide an individual towards career goals. Career management is the process of holistically managing one’s career proactively and consciously. Instead of floundering around and being unaware of the control one's career destiny, jobseekers will learn how they can mindfully guide their career and propel their careers forward towards personal and professional fulfillment through sustaining their employability. 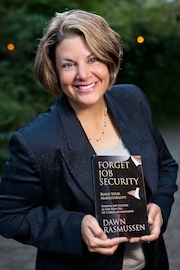 About Dawn: Dawn Rasmussen is the author of “Forget Job Security: Build Your Marketability,” a frequent MPI speaker, recognized career expert on Careerealism.com (top 10 world-ranked career advice blog), and has been quoted in the ChicagoTribune, CBSMoneyWatch, Christian Science Monitor, and Careerbuilder.com on career-related topics. When she isn’t busy helping clients, she is off hiking in Oregon’s beautiful mountains with Brad, her husband, and their two dogs.